This unique chess set reimagines classic game pieces as structures from around the Big Apple. Calling all adventurous chess lovers! London-based architects Ian Flood and Chris Prosser have reimagined your beloved game pieces, replacing them with meticulously crafted miniature renditions of famous Big Apple buildings. In their modern take on the classic game, Ian and Chris highlight structures both exceptional and everyday, like brownstones, which stand in for pawns, alongside acrylic renditions of the Guggenheim and One World Trade. Packed with its very own folding card chess board, this unique set makes a great gift for New Yorkers, chess whizzes, and lovers of high design alike. Made in the United Kingdom. Skyline Chess was founded by two London based architects, Chris Prosser and Ian Flood. 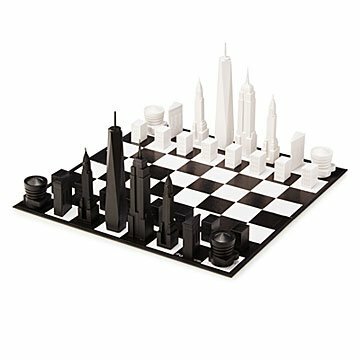 Together they take iconic architecture from around the world and re-imagine them as pieces on a chessboard, allowing you to play with your favorite cities and pit them against each other. The concept was first conceived when they shared a flat together and would play chess in the evenings. The idea grew out of a conversation about whether we could replace the classic pieces with our favorite buildings. This led us to design and develop our first set, based on the skyline of our hometown, London.